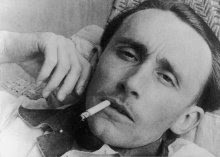 I should be preparing for house guests, but, oh no, that's just too banal, especially when one of said house guests has infested my brain with André Bazin. To supplement Girish Shambu's query as to which of Bazin's publications available in English he might be missing, I offer up—again—some samplings accessible online. As Girish detailed, the two volumes of [Qu'est-ce que le cinéma?] What is Cinema? (1967, 1971), translated by Hugh Gray contain many of his best-known pieces like "The Ontology of the Photographic Image," "The Evolution of the Language of Cinema," "The Virtues and Limitations of Montage," "In Defense of Mixed Cinema," and his essays on Italian neo-realism, the Western, Rossellini, Chaplin, Bresson, De Sica, and so on. I might add that huge chunks of Volumes One and Two are available for preview at the publisher's website. 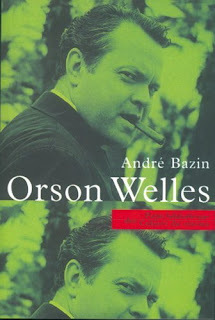 Of the remaining publications that Girish lists—Bazin at Work: Major Essays and Reviews from the Forties and Fifties (1997), Jean Renoir (1973), Orson Welles: A Critical View (1978), and The Cinema of Cruelty: From Buñuel to Hitchcock (1982), I offer up the publisher pages (where available) and remind that preview pages are available at their Amazon counterparts. Doug Cummings and Andy Rector have already recommended French Cinema of the Occupation and Resistance, The Birth of a Critical Esthetic (1981), translated by Stanley Hochman. 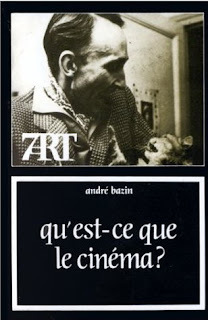 Bert Cardullo has translated two Bazin essays into English for Literature Film Quarterly; the first entitled "André Bazin on Rene Clement and literary adaptation: Two original reviews" and the second "André Bazin on Claude Autant-Lara and literary adaptation: Four original reviews." Film-Philosophy has published two Bazin essays likewise translated into English by Bert Cardullo: "The Life and Death of Superimposition" (originally published in French in Ecran Francais in 1946, then included in Volume 1 ("Ontologie et langage", pp. 22-30) of Qu'est-ce que le cinema? (Paris: Editions du Cerf, 1958-1962) and "Will CinemaScope Save the Film Industry?" (originally published in French in the 1953 October-November issue of Esprit, 21 no. 207-208, pp. 672-683). Bert Cardullo has also translated Bazin's essay "Cinema and Theology: The Case of Heaven Over the Marshes" for the Journal of Religion and Film. Bazin's 1952 Radio-Cinéma review of Carl Dreyer's The Passion of Joan of Arc—reprinted in The Cinema of Cruelty (New York: Seaver Books, 1982), pp. 19-21—is available online. Peter Matthews has written an appreciative overview of André Bazin for Sight and Sound—"Divining the Real"—available at the British Film Institute website. Offscreen has published two essays by Donato Totaro on André Bazin; the first is "André Bazin: Part 1, Film Style Theory in its Historical Context", and the second is "André Bazin: Part 2, Style as a Philosophical Idea." They've also published Prakash Younger's "Re-thinking Bazin Through Renoir's The River—Part 1: Bazin and The River as a Problem in the History of Film Theory." Bazin's religious affiliations are traced in a piece at Adherents. 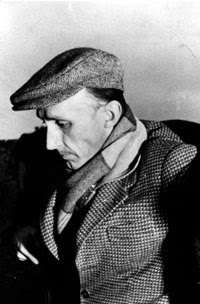 Greg M. Smith's essay "Reflecting on the Image: Sartrean Emotions in the Writings of André Bazin" is available in PDF format. Carlos A. Valle's tribute to Bazin is also available in PDF format. Film-Philosophy has Dan Friedman's review of Bazin at Work: Major Essays and Reviews from the Forties and Fifties, translated by Alain Piette and Bert Cardullo. Jumpcut has Bill Horrigan's review of André Bazin by Dudley Andrews. Separate entries on specific commentary available through Senses of Cinema and the Highbeam Research Library are forthcoming. Thanks for your effort, Maya. And hope the party goes well. Thanks, Pacze, wish you could join us. Will you be attending Toronto? Wow, what a cornucopia. Thank you! Michael, it's official: your energy reserves put the rest of us in the blogosphere to shame! I'll have to pick up some tips from you over the next few days. And of course, I've linked to these posts from my original Bazin post for future waybackers.